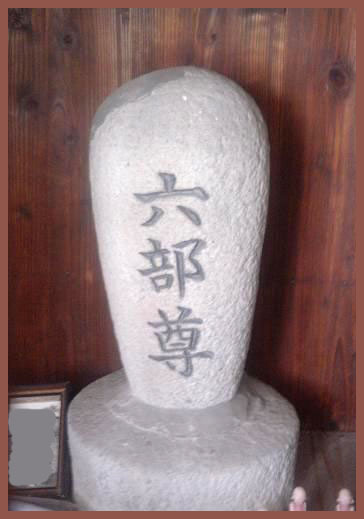 The Ujigami had made in known that the child would soon die of a water accident. 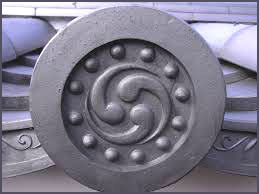 These kinds of tiles are often on the roofs as amulets to protect from fire.
. mitsudomoe 三つ巴 family crest . Daughter of 長田忠致 Osada Tadamune (? - 1190) named 清 Kiyo is said to have transformed into a Rokubu and killed all strong enemies. Once the wife of a rich merchant was ill and in bed. An itinerant Rokubu told them that under the floor in the Northern direction there was a rooster mound. The next morning they went there and dug - finding the body of 白雄鶏 a white rooster, almost like alive. The illness had been the curse of the rooster. Now they could built a sanctuary and pray for its soul. Before the Meiji period, near a swamp, there lived a Rokubu with his daughter. tori numa 鳥沼 "bird swamp". To our day sometimes the call of the rooster can be heard from the bottom of the swamp. 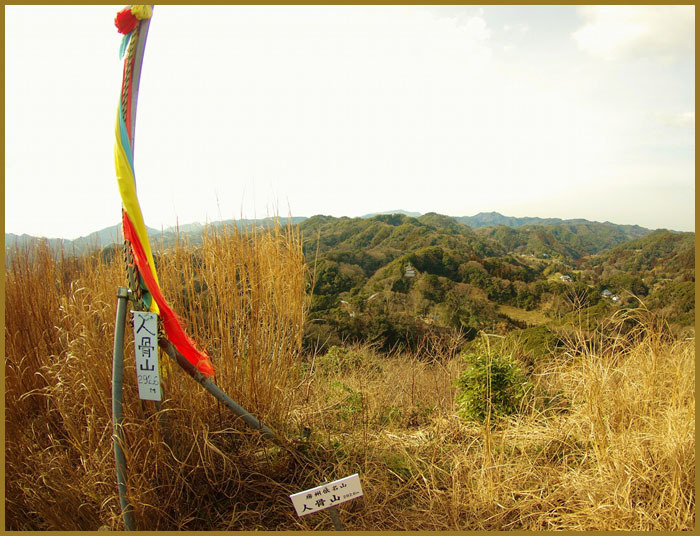 On 人骨山 Mount Hitoboneyama (human bones) 218 m, there lived a demon hag (鬼婆 onibaba), who needed a human sacrifice every year from the village. The whole mountain top was covered with bones of the female victims. 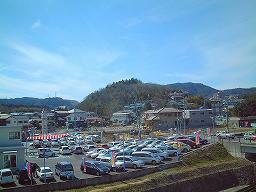 To our day there grow very few trees on this mountain, south of 鋸山 Nokogiriyama. Once an itinerant Rokubu came and tried to help the farmers. A strong dog named ドン太郎 Don Taro came running from the west and finally drove away the demon hag. 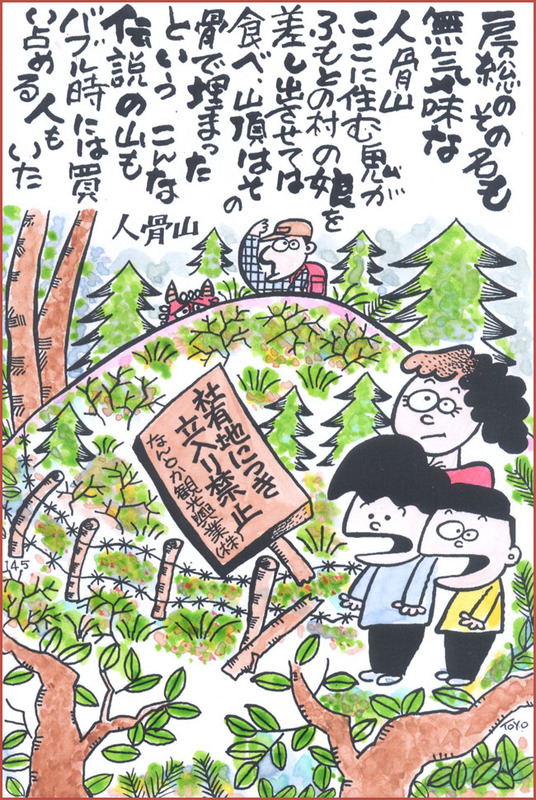 Old women from nearby villages also tell of a custom to bring the old hags to this mountain, like the famous "Obasuteyama" (オハツセ). The mountain might also have been a very old graveyard.
. Onipedia - 鬼ペディア - Oni Demons - Table of Contents - . This memorial was erected in 1767 when a Rokubu pilgrim died in the village. 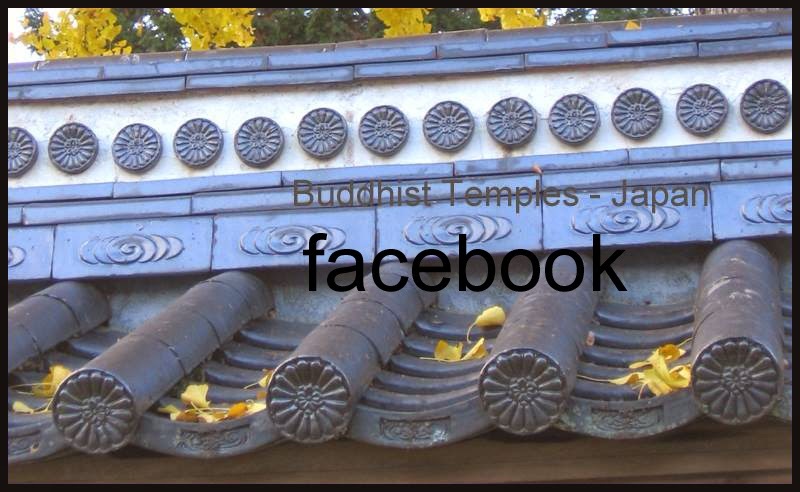 They erected a stone memorial and a small hall around it, 六部尊堂, promising to worship there regularly. But over the years all was forgotten and nobody cared for it any more. But in 1958 a new hall was built and the neighbors begun to worship again. The hall was renewed in 2014. A family had placed 餅 rice cake offerings for New Year at the grave when a Rokubu passed by. They thought he must be carrying a lot of money, so they killed him and took the money. But this brought a curse on them and next year and all following years they did not make rice cake offerings. They had to ask other families to provide offerings for them. And on the 15th day of the New Year they had to make rice cakes and give them to the other families in return. Once upon a time, a Rokubu wanted to walk over the pass at 宮成 Miyanari On the roof of one home was a famous archer who shot at the Rokubu. The arrow pierced the eye of the Rokubu and then - oh wonder, turned and flew back to the roof. 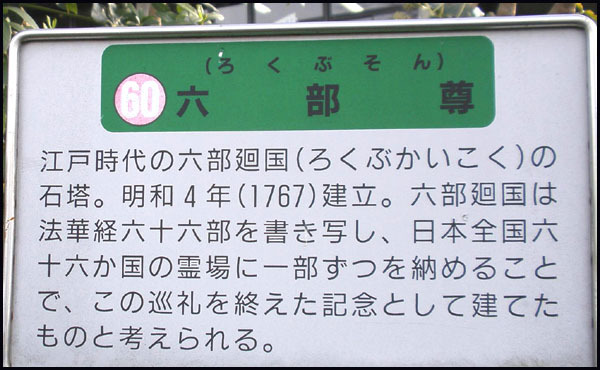 Once around 1835, when a man named 銀三郎 Ginsaburo was still young, a Rokubu stayed at his home over night. Next morning the pilgrim left while it was snowing heavily, but soon he disappeared completely. Since then a white mouse begun to live in the home of Ginsaburo. When Ginsaburo got married and moved into the home of his new wife, the mouse came with him. A Rokubu slowly lost his eyesight, became blind and could not go on any more. He stayed at the home of the family where this happened but soon his money was gone. Later a man of the family went to this field to cut weeds, but his horse stumbled and broke its backbone. 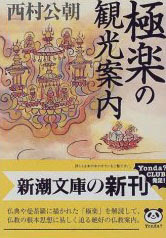 This was the curse of the Rokubu.
. hitobashira 人柱 "human pillar" sacrifice . 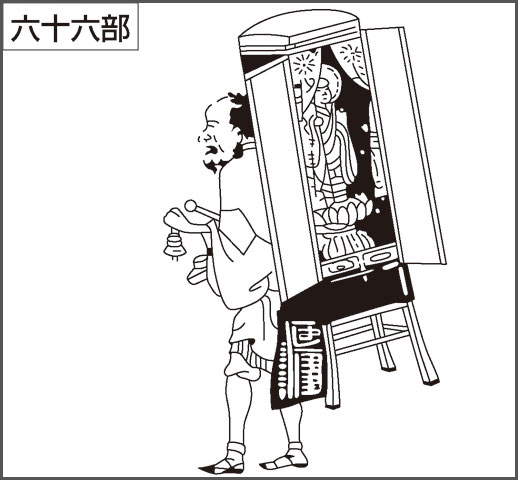 In 1585, when 秀吉 Toyotomi Hideyoshi built Ogaki castle, he used an itinerant Rokubu as a human pillar, buried alive. Her soul was kept there and every night at ushimitsu 丑三 the spooky hour people heard a prayer gong 「チーン、チリン」 chiiiin chirin. Every night a strange being appeared at the mountain hut. The forest workers were wondering what to do about it when a Rokubu happened to visit their hamlet. 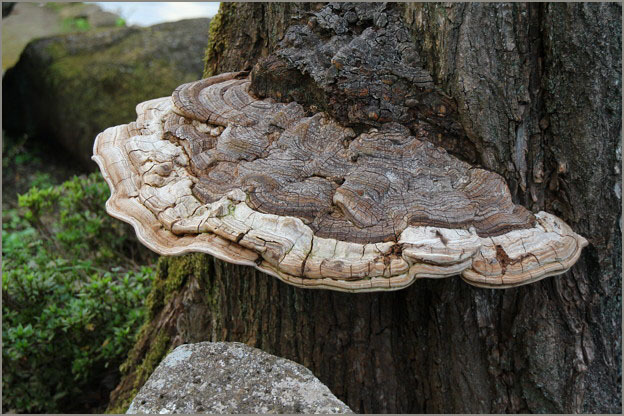 They found out that a mushroom growing on nearby tree, saru no koshikake 猿の腰掛, had turned into a monster. It would help if they could douse it in soup where an eggplant had been cooked. And indeed, when they did this, the strange monster did not show up again. lit. 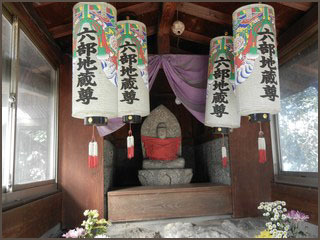 "ape stool" "monkey's chair"
At 大原岩崎 Ohara Iwasaki is a Rokubuzuka hill, where a Rokubu had been killed. Once a 馬方 horse leader stayed there over night. The Rokubu appeared in his dream and told him, if you pray to me I will make you very rich. ANd indeed, the horse leader soon became a rich merchant. 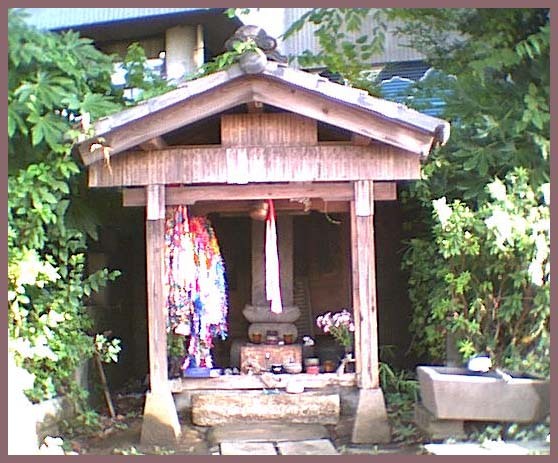 At the top of the hill is a shrine, 伊藤稲荷神社 Ito Inari Jinja. A certain family is now quite rich. This happened because once a Rokubu stayed at their home over night. They killed him and took away all his money to start a prosperous business. "I was quite furious, so I took their children and threw tham in the fire!" The Rokubu thought this was quite strange, but said nothing and went to sleep. When he woke up next morning, he realized he had been sleeping on a family grave. When he found the village and the home of the family, he heard that one child had been badly burned last night. This was the punishment for not giving offerings to the ancestors. In the family there had been a Rokubu lending them money, but then he died. The daughter would not go before giving the money back. So they put some money in her hand and then she became quiet, lay down and never moved again. Once upon a time, a serpent shape-shifted into a young man and begun to visit a certain girl. She eventually got pregnant. On the seasonal festival in March she should drink 桃酒 peach rice wine and on the seasonal festival in May she should drink 菖蒲酒 rice wine with iris. The girl did as told and when the time came she gave birth to a very long serpent. Once upon a time there was a family almost extinguished by tuberculosis. Their home was thought to be under a bad spell of monsters. Then came a Rokubu and stayed there over night all alone. On the 丑満 spooky hour if the night three monks came along, clad in white, yellow and black robes. They walked around the Rokubu on the floor three times, mumbling strange sutras and spells and then left. The Rokubu followed them secretly and saw them disappear in the horse stable. There he found gold, silver and bronze money burried in the ground. Some say this Rokubu was 三井家の祖先 the ancestor of the Mitsui family.
. Echigoya 越後屋 Mitsui三井 merchant.
. hihi 狒々 the monster baboon . "I give you one of my three daughters as a wife if you let the frog go!" So the youngest daughter had to go, but because of the son-in-law being a snake, she got more and more ill.
"If the son-in-law can climb up to the nest of a sagi 鷺 heron, (and get some eggs for the girl to eat), the girl will be saved." So he took on his real features of a snake, climbed up a tree and tried to get some eggs from the nest. But there he was caught by the heron and the bird swallowed the snake. The Rokubu was indeed the frog who had been helped in the past by Grandfather.
. a tonbi 鳶 black kite .